Why do we talk about a number of ecologies, not just one? It is difficult to bring down numerous relations in which we enter with the environment to a single way of acting and thinking. This complex wholeness, of which we are a part, needs tools of study from more than one discipline. The environment consist not just people but also animals, plants, other kinds of matter as well as any reliances and forces acting between them. While speaking about ecologies one need to mention Anthropocene. It is an epoch, distinguished by researchers, in which human impact on the environment was described as so invasive that the consequences of our species’ activity were found to be irreversible for the future of the planet. Some researchers argue that the initial moment for the Anthropocene was the learning of intensive agricultural cultivation, for others it is linked with the industrial revolution and the emergence of the steam engine. The awareness of the global impact of mankind on the environment paved the way for ecology and understanding of how the forces of nature act on us, contributing to the history of mankind (which could be well illustrated by the series of events around explosions of Icelandic volcanoes). The notion of the nature, as we know it, is the product of the capitalist system whereby it has become a formation alienated from the human being; something that functions beyond politics and social relations. More and more often however we become aware of the fact that what was assumed to be separated escapes separation, that the human impact on the environment is not the only and the most significant one, while technology allows to create more and more complex systems of relations among various species. The first day of the conference will be devoted to the city as the environment of living, in which grass-roots educational platforms play an increasingly important role. The questions to which we will be seeking answers are: in which way should we create urban institutions that act simultaneously in the cultural, social, spatial and political dimensions? Due to a flexible formula of action and collaboration with experts and people of different competencies, such institutions are able to respond accurately to the needs of the residents and very often offer more innovative solutions to urban problems. They teach various ways of participation, ecological design of common spaces, thinking about the city as community dependent on its surroundings but not exploiting them thoughtlessly. On the second day of the conference we will be considering how ecologies refer to artistic practices and what does it mean to work ecologically in the realm of the aesthetics. In what way may ecology influence the relationships between us, our bodies, other people, machines and technologies? If arts is a non-verbal way of communicating with the world and work on imagination, willingly employing utopian thinking, creating new relations and designing activities referring to our future, we should use its potential for creating other definitions of history, but also for analyzing the relations we enter with the non-human factors and for describing complex systems of self-organisation. For several years, we have observed intense civic activation in the Polish cities – the citizens have been setting up organizations and informal initiatives, called “urban movements” (for two years associated under the Urban Movements Congress) which lead intervention activities using – next to official and self-government tools - the whole spectrum of symbolic activities (including those supported and co-organized by the institutions in the field of art). Only the inclusion of the latter allowed to start the public debate and to outline the content distinct for each centre – implied by the frequently repeated after Krzysztof Nawratek postulate for restoration of the subjectivity of cities – that is not only their capability for self-regulation and efficiency but also for maintaining social, cultural, natural and historical uniqueness. We learn through action – when organizing even very small organic projects up to large collective protests. Recovering space and performative setting up its future, work on the local cultural and ecological identity – all this is gradually building our awareness of the complexity of the urban organism. The presentation will show examples of Polish urban movements’ activities. Marta Madejska - PhD student at the Institute of Contemporary Culture at the University of Lodz, coordinator of II Congress of Urban Movements, board member of the Urban Initiatives Association "Topographies" in Lodz, member of the Civil Dialogue Committee for participation by the City of Lodz Council. Urban wastelands are at the centre of conflicts about geographical, cultural, social and political hegemonies. Wastelands are commonly seen as being of value only in terms of their potential for development. Against the current backdrop of global economic slowdown, austerity measures and environmental instability, we reassess established notions of ‘value’, bringing to light the multiple approaches local communities take to utilise these ruptures in privatised cityscapes. Wasteland sites are one of the few remaining examples of ‘commons’ in the urban landscape: sites that, through temporary neglect by local authorities, are used as playgrounds, gardens, hideouts and even homes. Wasteland Twinning Network (WTN) hijacks the concept of ‘City Twinning’ and applies it to urban wastelands in order to generate a network for parallel research and action. Will Foster and Alex Head (co-directors of Wasteland Twinning Network) will introduce the various Wasteland sites spanning; Europe, Asia, USA and Australia. WTN will give an insight into project partners and selected projects throughout the past year. The Games; two temporary sporting interventions: The Nottingham Rounders Club and The Fallow Games in Berlin parallel projects which took place on wasteland sites in June 2012. The Wasteland Twinning Ceremonies’; Partnerships between Ambassadors and representatives of the wasteland sites in the network. Partnerships were initiated on the grounds of political, social, economic, historical and environmental conflict or unity. Objective Dialogues Y-Table; a research vehicle developed with The Anxious Prop from which pairs of investigators could examine debris collected and submitted for analysis from the seven wasteland sites profiled within the Wasteland Twinning Network Forum, September 2012. Artists Impressions; A mass-participation public art project focusing on unrealised development plans for wasteland sites in Nottingham, Amsterdam and Berlin. The project will collaborate with communities around these sites to stage re-creations of the architectural visualisations that accompanied master plans for their development, casting participants as the fictional characters populating unrealised architecture. Throughout the presentation of these projects WTN will draw on theory bringing to light varying definitions and categorisations of artistic research and urban land use. The Philosopher Jacques Rancière, specifically the keynote lecture 'Aesthetic Separation, Aesthetic Community: Scenes from the Aesthetic Regimes of Art', delivered at University of Amsterdam, June 2006. Wasteland Twinning Network aims at understanding and extending the meaning of wastelands within urban environments and thus create a deeper understanding for the respective structural conditions underlying the land. The main focus of the collectives activity is the international platform for mutual exchange of research and art practices: ‘www.wasteland- twinning.net’. Wasteland Twinning is interested in creating a network of artists, researchers and citizens. Matthias Einhoff, Will Foster, Lars Hayer and Alex Head. The Arts Catalyst is interested in interrogating, through art practice, the fast-changing practices and spatial dynamics of science and technology, and exploring how our cultural imaginaries can respond to these developments. Change that is too rapid can be deeply divisive. If only an elite can keep up, the rest of us will grow increasingly mystified about how the world works. How do we, as artists, social progressives and citizens, engage with the practices and spaces of science? How can we involve people from diverse disciplines and backgrounds in discussing and generating new ideas and alternative perspectives on science and culture? As well as more established methods of artistic production and public engagement, the Arts Catalyst is exploring methodologies such as critical excursions, overt research, open labs, fieldtrips, DIY bio, and extreme citizen science, to develop a playful and provocative cultural and critical discourse. The Manifesto of Urban Cannibalism is a dystopian celebration of the "big stomach outside us", the inorganic life populating our cities and the hungry metabolism of human history. It was written in 2012 by Wietske Maas and Matteo Pasquinelli to sediment five years of practice and investigation within their project Urbanibalism and also as a statement against the superficial aesthetics and ideologies of sustainable development. 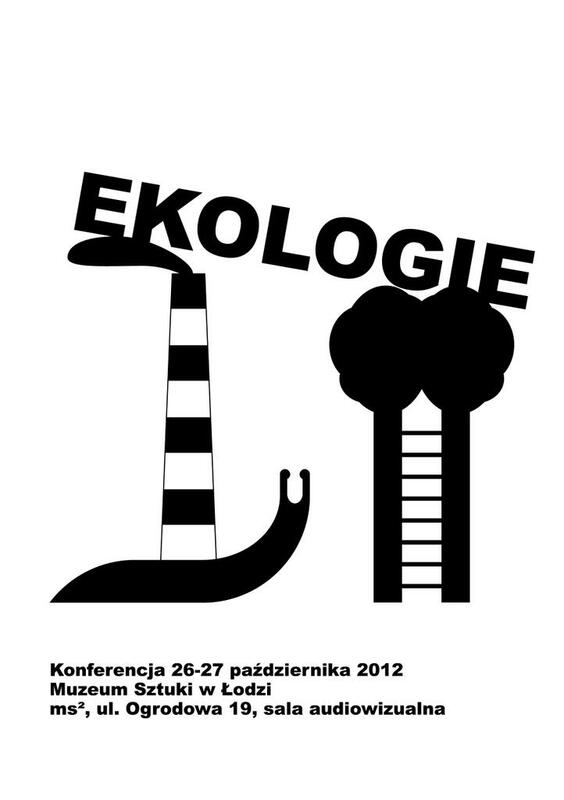 In Lodz the Manifesto will be presented together with a selection of projects from Urbanibalism (www.urbanibalism.org). Living in Amsterdam and Berlin, Wietske Maas and Matteo Pasquinelli established the Urbanibalism project in early 2007 exploring the Umwelten of different cities and organising convivia also in Utrecht, Brussels, Melbourne and Istanbul. Wietske Maas combines artistic pursuits with work as a programme curator for the European Cultural Foundation (www.wietskemaas.org). Matteo Pasquinelli is a theorist and academic researcher. He wrote the book Animal Spirits: A Bestiary of the Commons (Rotterdam, 2008) and he is currently working on a research on the genealogy of German and French biophilosophy (www.matteopasquinelli.org). In this talk I will focus on the contemporary practices of trans-species mixing, mingling and blending happening both on the level of food webs and the direct intervention into materiality of life practiced by scientists, bioengineers and artists. But all this is also present on the level of convictions and desires shaping individual and social practices. Bio-con-fusions, positioning humans at loose ends, significantly challenge anthropocentric hierarchies and therefore contribute to the development of nonhuman-friendly attitudes. They shift our attention from human subject to nonhuman life forms such as animals, plants, microbes and also towards life forms which exist and survive only with the technological support. Confusion may be only a temporary symptom of a highly invigorating shift from the anthropocentric stupor of the rigid subject isolated from other life forms to the much-needed multiple subject operating in a mode of continuity and symbiosis. Starting out with my latest involvement in dOCUMENTA(13) presenting "The Worldly House" project, the talk will raise fundamental questions about cultural production, otherness and multispecies intra-action thereby drawing up the contour for a new posthumanist paradigm. Doing so I will also be touching upon earlier projects such as "Diffuse Einträge", The sculpture projects muenster 07 and upcoming projects. Tue Greenfort’s interdisciplinary practice deals with issues such as the public and private realm, nature and culture. Interweaving these subjects with the language of contemporary art the artist formulates an often direct critique of current economical and scientific production practices. Fascinated by the dynamics in the natural world, Greenfort's work often revolves around ecology and its history, including the environment, social relations, and human subjectivity. Tue Greenfort (*1973 in Holbaek / Denmark) lives and works in Berlin where he is represented by Johann König. He has had extensive solo presentations at South London Gallery, London (2011), the Kunstverein Braunschweig (2008) and Secession, Vienna (2007). He has participated in numerous international exhibitions held at institutions like the Kunstverein Hannover (2011), Royal Academy of Arts, London (2009), Bonniers Konsthall, Stockholm (2009), the Fondazione Morra Greco, Naples (2008), Skulptur Projekte Münster (2007) and Witte de With, Rotterdam (2006). Among his publications the most comprising one, Linear Deflection, was published by Walther König in 2009. 12:10-12:40 Paul Chaney (FIELDCLUB) - Humiliating Ecologies – Perspectives emerging from FIELDCLUB practice. Paul will present documentation from the last 6 years of the FIELDCLUB project – an experimental smallholding in the Southwest of the UK, originally set up to interrogate the premise of subsistence farming and off-grid living in a post-industrial society. The project explores certain problematic complexities concealed within this particular environmental ideology, and illustrates the principles of dark ecology through practice ‘on the ground’. The FIELDCLUB project unavoidably engages with some of the more difficult areas of a post-human concept of nature. He will also present a prototype FieldMachine – a custom designed software tool that models systems of food production based on a theoretical equal division of available agricultural land between contained populations. FieldMachine embodies a ‘democracy of design’ and attempts to approach the problem of imagining wide-scale alternatives to the industrially dependent city model. He will also discuss some of the implications for the ‘concept of nature’, and the direct challenge to anthropocentrism raised by Speculative Realism and Geo-philosophy. Paul Chaney is the lead artist/director of FIELDCLUB – a four-acre field where art has been used as a catalyst to interrogate models of subsistence farming and off-grid living since 2004. Working as FIELDCLUB, Chaney, and his collaborator Kenna Hernly, developed a computer software application to design systems personal self-sufficiency. This software is used to perform ‘Hypothetical Reterritorialisations’ where the public are asked to design systems for food production in urban and sub-urban locations. A central theme of the FIELDCLUB project is to push the boundaries of post-humanist thinking through practical research on the ground. Chaney has recently presented FIELDCLUB work at The Serpentine Gallery, London and TATE. In 2009/10 Chaney worked with Urbanomic – an international arts organisation and publisher of the infamous COLLAPSE – Journal of Philosophical Research and Development, to deliver a program of art events and residencies in the UK. During this time he worked with philosopher Robin Mackay to develop Agrosophy – a weird fusion of contemporary philosophy and agriculture. Recently he has been working with Mackay to explore elements of Geo-philosophy – a genre emerging out of Speculative Realist thinking. More recently, he has been developing work in the Czech Republic and Ukraine, using Geo-philosophy to explore new post-human approaches to analyzing the prerogative of population growth and ‘progress’. Sin Kabeza Productions is a collective of artist and activist researchers dedicated to the creation and dissemination of experimental transmedia with an emphasis on feminist and postcolonial approaches to multispecies storytelling. We seek to confront colonialites of power (race, gender, nature) by providing experimental decolonization strategies through diverse media interfaces. In our presentation at Urban Ecologies we introduce SEEDBANK, a speculative architectural site and experiment in design fiction that attempts to meet with bacteria as actants and as bio-semiotic tropological figures. Our interest in bacteria is inspired by Myra Hird’s investigation in The Origins of Sociable Life, where she emphasizes the microbial organism’s importance in the re-figuring of contemporary evolutionary theory. For Hird, naturalcultural stories of bacteria help to shed light on “microontologies,” which she defines as “a way for humans to understand that they are enmeshed in a complex web of co-domestications,” where the symbiotic evolutionary stories of bacteria may help audiences to move beyond the premise of human exceptionalism, or the idea that humans beings are the most significant species. Following Hird, we extend the microbial organism’s importance in the rethinking of contemporary evolutionary theory to the realm of symbiotic co-evolution in knowledge production, which includes art and culture. Just as DNA is situated with the bacterium’s organism, so SEEDBANK becomes an archival site for the display and dissemination of posthumanistic research. In concert with a growing field of transdisciplinary scholars, our presentation is rooted in natural-cultural inquiry, a field of research that seeks to explore how diverse ecological beings develop in relation to each other, while postulating an ethical responsibility to cultivate practices of care with unseen and unexpected partners. In an attempt to move beyond Eurocentric epistemologies SEEDBANK’s architectural design engages the teachings of Jain spiritual leader Lord Mahavira, who as early as in the 14th century declared that humans should not take care of nature for their own benefit, but out of respect for the consciousness of all life; as such the design of the bacterium is inspired by Jain followers who assert that the earth must be protected and infracted upon as little as possible. In an effort to enact the extraordinary possibilities of what Donna Haraway calls the SF mode, SEEDBANK’s design plays cat’s cradle with science fiction writer Octavia Butler, and her novel trilogy Lilith’s Brood (Xenogenesis Trillogy) where an alien race called the Oankali, who have specialized organs and subcellular structures that allow them to manipulate their genes, create a starship that is self- sustaining and itself a living organism with subcellular structures that maximizes its fitness with the surrounding environment. Cheto Castellano is a self-taught visual artist and filmmaker. He was born in Chile but now leads a nomadic lifestyle between the Americas and Asia. His current work explores how colonialities of power, nature, and gender produce conditions of slavery and oppression for both human and non-human species. Many recent collaborative projects, including, Kiltr@s (2012), Revisiting Art Farm (2012), and SEEDBANK (2012), apply transmedia methodologies to posthumanistic research and develop multimodal platforms using visual anthropology, video installation and architectural design. His experimental film, SEED: Visualscapes from the Future envisions the near future through an ethnographic gaze, constructing a post-gender society where water is scarce and planting seeds holds revolutionary potential. He is the co-founder of Sin Kabeza Productions, which is dedicated to the creation and dissemination of experimental transmedia and which recently displayed a collection of its experimental work at dOCUMENTA (13)’s The Worldly House: An Archive Inspired by Donna Haraway’s Multispecies Writings, and which organized CoEvolutionHYPERLINK "http://www.ici-berlin.org/event/455/" and Complementarity: Encounters between Transmedia and Multispecies Storytelling at the Institute of Cultural Inquiry Berlin. Lissette Olivares is an artist, activist, curator, and transmedia storyteller that is committed to interdisciplinary approaches to knowledge production. Her work as an artist-agent investigates the realm of human, animal and ecological exploitation through diverse technologies including creative writing, performance, intervention, experimental video and multimedia installation. Three recent collaborative projects, Kiltr@s (2012), Revisiting Art Farm (2012), and SEEDBANK (2012), develop transmedia methodologies for multispecies ethnography using visual anthropo(zoo)logy, video installation and architectural design. She is the co-founder of Sin Kabeza Productions, which is dedicated to the creation and dissemination of experimental transmedia and which recently displayed a collection of its experimental work at dOCUMENTA (13)’s The Worldly House: An Archive Inspired by Donna Haraway’s Multispecies Writings and which organized CoEvolutionHYPERLINK "http://www.ici-berlin.org/event/455/" and Complementarity: Encounters between Transmedia and Multispecies Storytelling at the Institute of Cultural Inquiry Berlin. Faced with the steady advance of bad news about climate change futures, this presentation approaches the probability of severely increasing global environmental and civil instability via indirect routes. It searches for the sources of potential disaster in everyday systemic performance encounters between the Earth’s ecologies and human individuals. It suggests that the eco-activist motto ‘Think global, act local’ is no longer fit for purpose. The globe’s ecological processes are not divided up by such binaries, and neither is the cognition and embodiment of humans. But the majority of Homo sapiens continue to behave as if they are, and the double binds of compulsive denial and inertia tighten as the biosphere heats up. The presentation explores how combinations of human artistic and scientific experiments might alleviate or reverse those dangerous tendencies. In looking closely at specific performance practices, it also proposes that momentous eco-sanities can be created for humans by momentary events. Baz Kershaw is Emeritus Professor of Performance, University of Warwick, and previously held the Foundation Chair of Drama at the University of Bristol. Originally an electro-mechanical engineer, he later studied at the Universities of Manchester, Hawaii and Exeter. He has worked extensively in experimental, community-based, site-responsive and eco-oriented theatre, and recently established an Earthrise Repair Shop for performance conservation and regeneration. His many publications include The Radical in Performance (1999), The Cambridge History of British Theatre Volume 3 (2004), and Theatre Ecology: Environments and Performance Events (2007). Tatiana Czekalska (born 1969, Łódź) graduated from the Lodz Film School and from the Department of Fashion Design in 1995. Since 1996 has worked in a duo with her husband Leszek Golec. Member of the International Supreme Master Ching Hai Meditation Associations since 1999.